A wise and very human monk once said to me that the things between God and us can be truthfully spoken about only in the way that friends talk to friends. I have tried to write down a partial record of such talk. 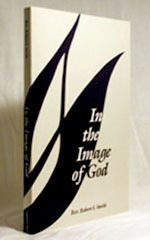 I hope this book will help you to discover something more of the depths of your own self… in the image of God. By profession I have many books to recommend on scripture, doctrine, history. This at last is one I can give to those who ask me about my faith, my struggle to pray, my attachment to the church. A redeeming presence illumines these quiet, intelligent and effortlessly authoritative reflections. Rev. Robert S. Smith is a priest of the Diocese of Rockville Center, New York. Since his ordination in 1958, he has served as a Professor of Philosophy in the Diocesan Seminary, as a Campus Minister at several universities on Long Island, and is presently Chaplain to the staff of University Hospital at Stony Brook.